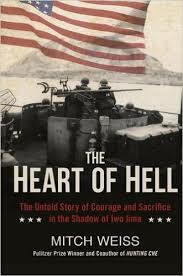 Dennis Blocker was lead researcher on Pulitzer Prize-winning journalist Mitch Weiss's non-fiction book, The Heart of Hell: The Untold Story of Courage and Sacrifice in the Shadow of Iwo Jima. After the death of his grandfather, Blocker set out on an epic journey to find the crew who served with his grandfather on Landing Craft infantry 449 in the Pacific campaign. He interviewed over 100 survivors and family members to piece together the eight critical months leading up to the battle of Iwo Jima. Join us for this special and informative program on Saturday, July 30th @ 5:00 PM.